The prior owner had an amazing collection of tools, all of which came with the boat. In the first 9 months I had been working on the boat off and on, I had bought one tool – just one (which I only used one time). But, his method of organizing and mine were just not the same. 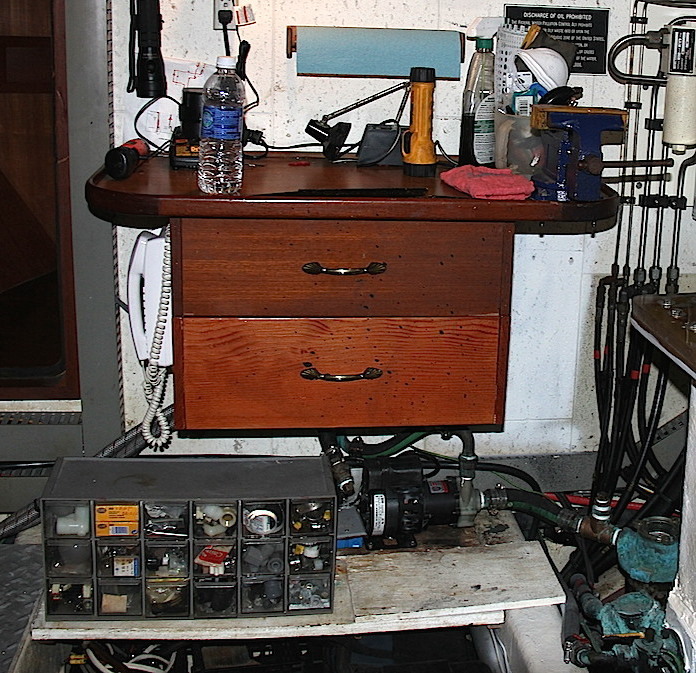 When we bought the boat , the tools were spread out in several small toolboxes on the engine room floor, plus the drawers in the teak workbench. He could find things; but he had owned the boat for 10 years. I could not find a thing. So to make it more “compatible” with my memory (or lack thereof), a reorganization was in order. Consolidation into a stand-up 6-drawer tool chest seemed to be the best option, while still leaving a bit of a work surface and a place for the vice. But then the problem was where to put it. About the only option was to replace the teak workbench with the tool chest. But I could not find a tool chest that would span the stringers for support. Plus the A/C water pump was under the old workbench. 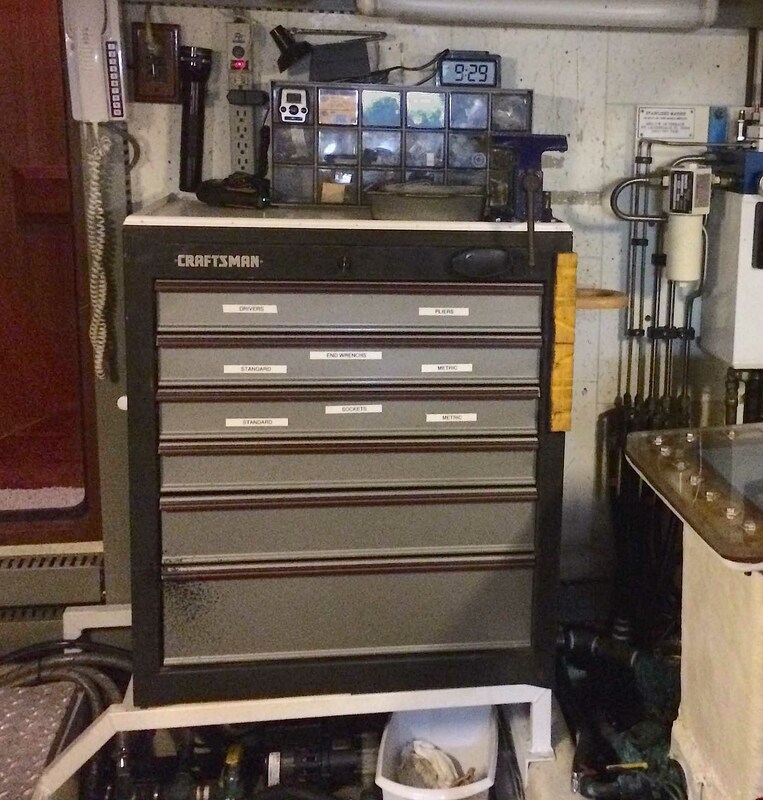 The solution was to build a brace to support a 44″ tool chest, and at the same time lift it up, making room for the A/C pump. That required moving the pump down to a new shelf between the stringers, and then mounting the chest on the new brace above it. A piece of artificial decking material (made from recycled plastic bottles) was used as the pump shelf. The brace was welded 1-inch square tubing that sat right on the stringers. 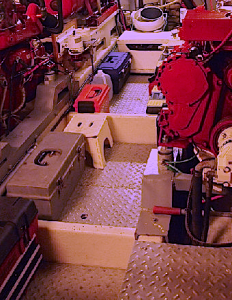 The upright close to the engine room door was angled, so as not to be a trip every time you entered the room. After moving the pump, the brace was mounted and the tool chest was bolted to both the wall and the brace. Then came the sorting of the tools…not an easy project. That took longer than building the brace! Plus they did not all fit! But they are all now in the chest plus just one toolbox on the floor, and things are easier to find – at least for me!